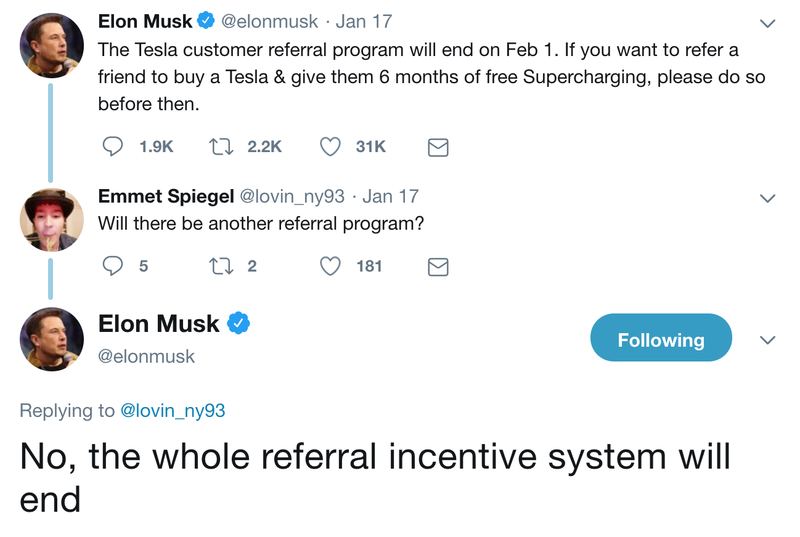 Tesla Ending The Referral Program On February 1st — But Why? The purpose of writing this article is to tell you my experience with the Tesla referral program and why I think it is ending. I’ve been talking and writing about cars since about 1974. I was very interested in the transition from rear-wheel drive to front-wheel drive. It seemed like such a large change in the industry. But compared to the transition from gas-powered cars to electric ones, it is small. Front-wheel drive cars use a little less gas and have a little better fuel economy, but they don’t disrupt the oil industry or threaten to ruin the careers of thousands of engineers and production associates in the automotive industry. No, this a much larger transition. I’ve been interested in this transition since about 2010. I had heard of electric cars before then, but I really thought they were a joke. But I remember seeing some articles on the upcoming Nissan Leaf and Chevrolet Volt. Gas had spiked up to almost $5 a gallon and I wanted to try something to save money. My brother-in-law in Brazil said that many people converted taxis there to use natural gas and that saved a lot of money, but if your installer made a mistake, your car blew up. That didn’t sound very safe. I looked into the only production car that uses natural gas, the Honda Civic GX, and that sounded a lot safer. I found out there were only a couple stations in Tampa and thought that might be an issue, but range was good at about 250 miles. The Leaf and Volt could charge at my house, which sounded a lot easier, and the cost savings were similar. I wasn’t worried about long trips, since I would take my Honda Odyssey for those. So I decided to buy either a Leaf or a Volt. They were both coming out about the same time and I picked the Leaf for 3 reasons. The Leaf seated 5 and the Volt seated 4. I have a family of 5, so the Leaf could take the whole family. This ended up not being that important for my family, but it was better for carpooling kids. I was (and to some extent, still am) upset with GM for taking the bailout. The Leaf was about $5,000 less and I figured if I needed more range, I would trade cars with my wife. So after an 18 month wait, I purchased the Leaf on December 1st, 2012, making me one of the first EV owners in Florida (other than a few Tesla Roadster owners and people who had converted their cars in their garages). I got invited to the local AAA office to the grand opening of their level 2 chargers and got interviewed by several of the local TV stations. I emphasized how the car was “normal.” It was quite fast off the start and very quiet, and of course emissions free. In talking to hundreds of people about my Leaf (and maybe a million on the morning news), I convinced my manager to buy a Leaf via a $199 leasing special. Most people thought it was a neat idea, but didn’t like the styling or the hassle of the short range and having to find charging stations. When I heard the Tesla Model 3 was coming out for $35,000 and it was rumored to be fast, good looking, and have over 200 miles of range, I was interested. Not interested enough to stand in line or take off work, but interested enough to go online to put down a $1000 reservation an hour before it was revealed. Remember, I paid more than $35,000 for my top-of-the-line Leaf! I figured if I could get a Tesla for the same or a little more money, it would be a good deal! When it came time to configure my order, 2 years later, I was disappointed that the $35,000 car wasn’t available and I would have to either buy a more expensive model or wait a little longer. I discussed it with my wife and although I wanted the short range model, she wanted the long range model anyway. We decided on a color (I talked her into Midnight Silver) and she talked me into the performance wheels, saying the aero wheels looked geeky. Since I don’t really do a lot of highway driving, I was undecided on Enhanced Autopilot, but decided to get it because I really want full self driving when it comes out and it saved you $1,000 to buy it up front (now it saves you $2,000). When I received the car, it was everything I hoped it would be — fast, fun, and good looking! As I’ve written before, people were much more interested in the Model 3 than they were in the Leaf. Almost everyone who sees and rides in the car comments on how they see this is the future and will buy an electric car at some point in the future. Most are not ready to make the switch today. It is just too different for them to absorb all that new technology. I understand. I felt the same way when I first saw the iPhone. It was neat, but I just couldn’t understand how it would change everything. I had been reading CleanTechnica for years and seriously considered going to an EV conference that they participated in over in Cocoa, FL. Unfortunately, the conference was during the week and I didn’t want to take vacation time to go to it. But I did want to meet some of the EV experts that worked at CleanTechnica. When I read that Zachary was moving back to Sarasota and hadn’t yet driven a Model 3, I knew that I should let him drive mine. This was back before you could go to a Tesla dealer and just drive them anytime. In July 2018, the dealers didn’t have any demos yet. So I drove there with my friends and got to meet Zachary! After that trip, Zachary encouraged me to start writing a little bit for the site. I had been promoting Tesla on my Facebook timeline for years, but the reception was not especially warm. Most of my Facebook friends didn’t like Tesla, since they received help from the government and thought the company would fold as soon as the subsidies ended. I found when you write for a site that is pro EV, that you get a much better reception. But What About The Referral Program? 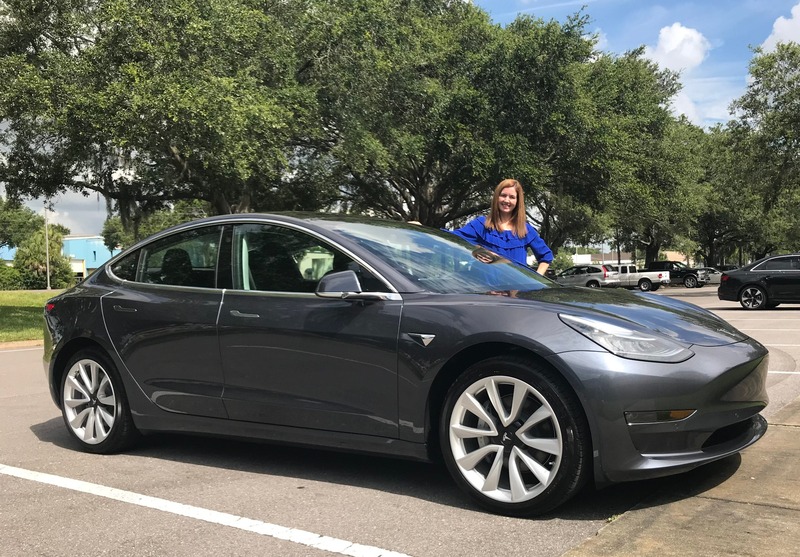 Yes, I get a little off topic telling stories, but the point is to give you context that I didn’t start out just trying to get Tesla referrals. I really do have a long interest in EVs and just stumbled into the referral program by accident. For my first 6 articles, I didn’t even include my referral code. The free Supercharging was only good for Model S and Model X cars (later, the Model 3 Performance was added) and I figured everyone I knew and who read my articles couldn’t afford that expensive of a car. That all changed on October 6th when Tesla expanded the referral program to allow buyers of ALL Model 3s to get free Supercharging! I knew that the $49,000 car with tax credit, gas, and maintenance savings was affordable to many more people, so I started to include my referral code in my articles, while also encouraging people to use codes of people they know in person. I didn’t know if people would use it, but I thought I might as well include it, just in case they didn’t know any Tesla owners. The prize I really wanted was to be invited to the Model Y unveiling (5 referrals). Things have changed a lot in 3 months. As I mentioned this past week, I now have 75 referrals and have found out that there are secret levels that allow you to get discounts on the upcoming Tesla Roadster. It appears I get 1 Roadster free and 1 at a 40% discount. I hope to get a few more referrals in the next 2 weeks so I can get a larger discount on the second Roadster. The taxes and insurance on the Roadster may be quite high, so it may be tough to afford it, even it is free, so most people who have a lot of referrals are trying to get 2 so they can sell one to pay the taxes on the other— and can thus keep it. Otherwise, most will just have to sell it instead of driving it. For each referral, someone in my position gets another 2% off the price of a Founder’s Edition Roadster, which is expected to cost $250,000. So, each referral is worth $5,000 before tax, about $2,500 after tax. The benefits to the buyer are unfortunately smaller. The 6 months of free Supercharging (9 months if you haven’t test driven a Model 3) is worth about $200, assuming you use it for 1000 miles a month for 6 months instead of charging at home for 13 cents a kWh. Note that the price of supercharging just went up (it now can be different at every station and is not constant throughout the state) and is about 30 cents a kWh. So, if you compare it to 9 months at 1000 miles a month and 30 cents a kWh, your savings go up to $675. So, while the lower level prizes are about equal on the buyer and referrer side, the larger prizes are much larger for the referrer. This encouraged some bad behavior, with people advertising their referral codes and sponsoring shows to have people feature someone else’s referral code. The problem is this is both getting expensive and making the brand seem a little like a multi-level marketing scam. Let’s play with some numbers. If Tesla sells 400,000 cars next year and every person uses a referral code from an owner who’s buying a Roadster, they would be giving up to $2 billion in discounts on 8,000 Roadsters. That is about double Tesla’s expected earnings next year. That would be a serious problem. As time went on, more of the owners would unlock the secret level and cost the company significant money. The publicity of the bad actors and inequity of the benefits between the buyers & small referrers and the large referrers (like myself) would be bad for the brand. Giving away too many free Roadsters would hurt the image of that car. If it is to keep it’s exclusive allure, they can’t build and give away too many of them. Giving away free Supercharging encourages people to Supercharge instead of charging at home. This is not how the system is designed, and with many more Tesla’s hitting the road in the next year, it could cause overcrowding. I think it is a good decision that Tesla is ending the referral program for all the reasons I explained above. I promoted EVs before the referral program and will continue to promote them after it ends. But I will admit it did change my behavior somewhat. It encouraged me to write more on Tesla and less about the other EVs out there (although, honestly, in the US, there wasn’t much going on more exciting than the Model 3 explosion in sales). I have several articles on other subjects (hybrids, solar, etc.) that I have delayed to focus on Tesla, since the referral program is a limited time opportunity. With all of that said, if you want to take advantage of my Tesla referral link to get up to 9 months free Supercharging (6 months if you have test driven a car with Tesla) on a Model S, Model X, or Model 3, here’s the code: https://ts.la/paul92237 — but as I have said before, if another owner helped you more, please use their link instead of mine.